Way back in '96 I picked up Tool's Aenima CD. If you recall, the album had some pretty disturbing images that could be animated with the grated jewel case. I distinctly remember my mother finding the case. She picked it up and mulled it over. Then she looks at me and says, "Is this something I should be worried about?" I remember this event because it was a pivotal moment for me. I was just barely to the age where you start to understand your parents. When she posed the question I remember thinking, "Maybe this IS something we should be worried about." One of the writers for 4cr is having one of these moments. He printed off a GameFAQs walkthrough for Castlevania, and accidentally mixed a page up in some forms his mother needed to sign. 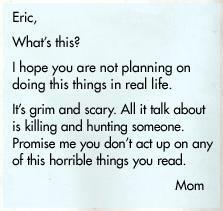 This is the note the concerned mother left for her son. I still listen to Aenima, and I think Eric will be ok. But thanks for worrying about us anyway. I was in maybe 7th grade when I got invited to go play D&D with some friends. I had borrowed the player's guide and was trying to decpiher how to create my first character. I told my mom I was going over to said friend's place to play. She took a look at the PG under my arm and said "Oh, you're going to go worship the devil and jump off of the roof of a house eh?" I said yeah and that I hoped to move up to human sacrifice soon. We both smiled, hugged and I went out the door. yeah whatever matt, I disntincly remember you haveing to sneak over to play shadowrun. But D&D was okay....I never did understand that. Of course your dad was also the guy who discovered the magic amount of grain to give the peasants in Romance of the Three Kingdom that would most likely boost loyalty. Which also reminds me, do they still live on Endor. God your parents are weird. Thanks, Earl. We love you too. Whenever you're on Endor, drop by! I think I just got busted. That'll teach me to try to be funny on the internet. ummmm...and that of his friends as well!